Sonshine Hacienda is into its fourth year of operation. It's taken this long to develop the plaza. 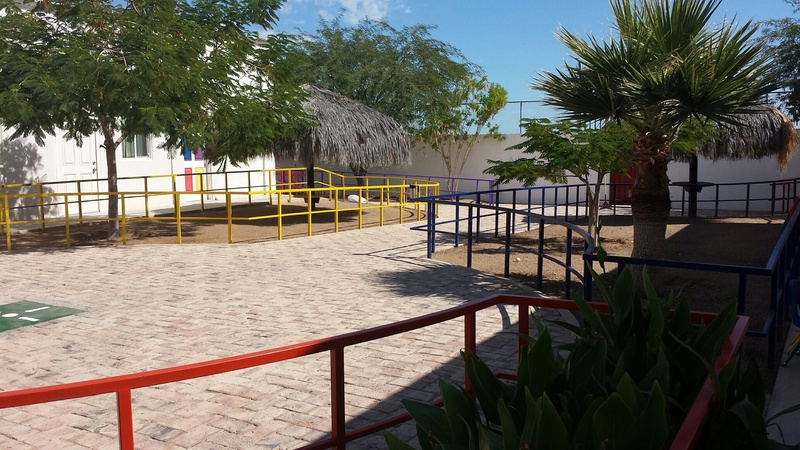 The plaza at Sonshine Hacienda is the area within the U-shaped layout of the buildings. By looking on the masthead picture, just above this article, you can see the plaza. You will notice nothing but dirt in the middle with the two palapas, the palm branch umbrellas. We aren't finished yet. Gates have to be put into each set of railings so the kids and gardeners can enter and play or work. Inside each colored rail fence will be seats and play areas. Thanks to all who support Sonshine. A special thank goes to Jim Onsager who provided the railing and installed the first two sets of railings before succumbing to cancer. Sonshine plans to provide a plaque in the plaza to commemorate Jim's contribution to the kids of San Felipe and Sonshine Hacienda. Just like Jim Onsager made a difference, your prayers and monetary contributions are literally saving and changing the lives of precious children. Marketplace Missions originally came to San Felipe to evangelize, train adult leaders, and host mission teams. Little did we know God would lead the MPM missionary team to start evangelizing and training with the abandoned and neglected children of Baja California. Bob Lewis is a board member of Marketplace Missions, Inc. (MPM) and also of Marketplace Missions A.C., the Mexican corporation, which owns Sonshine Hacienda. He has been with MPM since the beginning in a volunteer capacity. Now he and his wife Debbie live 8 months of the year in San Felipe. 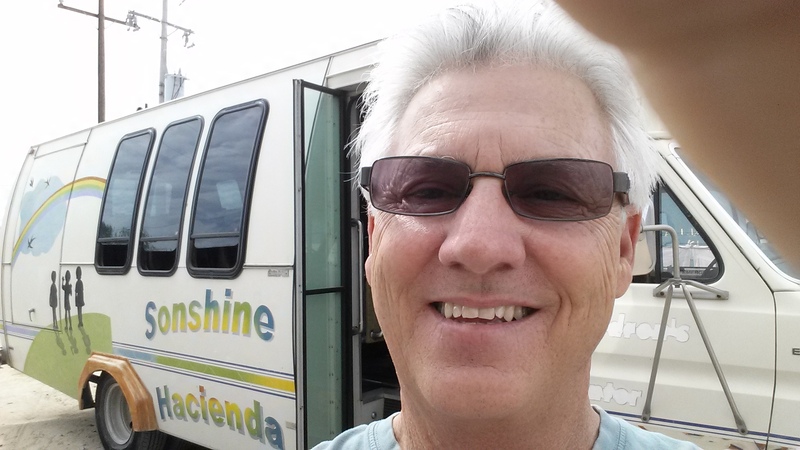 This Fall Bob added bus driving as another area where he would help the Sonshine Hacienda staff. The children are bused to three different public schools at different times during the day. Some schools have morning sessions; others have afternoon sessions. So far Bob has not lost one kid. But don't stop praying. Three weeks ago our doorbell rang at Sonshine Hacienda. When we opened the door, we found 13 year old Angela* at our gate by herself and she was holding a small black plastic bag. She asked to come in. Angela had previously been with us for over a year and was a delightful young teen. She loved living at Sonshine Hacienda. Angela always had a fantastic attitude. What happened? Well, about four months before finding her at our front gate she had been removed from Sonshine Hacienda and back with her father by the Mexican authorities. We did attend her graduation from sixth grade in May but that was the last we heard from her. That is, it was the last we heard from her until the day she rang our doorbell, which was just days ago. And here's what I wanted to share with you. This amazing story illustrates the reason we are here. As Paul Harvey used to say, "Here's the rest of the story." While Angela lived with us she had a nanny that had a big impact on her life. Her nanny had been a victim of abuse as a young woman and she educated the older girls about some things that they could do in order to feel safe and prepared if and when they left Sonshine Hacienda. She told Angela to pack a few essentials in a small bag and put it in a safe place so that if she needed it she could be ready to go. She also told her to find a taxi and they would take her to a safe place. What words of wisdom! When taken from Sonshine Hacienda and her nanny, Angela found herself living in a house with 10 people. One night Angela had a very bad and dangerous encounter with one of her uncles. That was enough for her! Her father had done nothing to protect her, but she knew of a safe place...a sanctuary where she would be protected. Angela went to her secret hiding place and retrieved her small plastic bag. When it was daylight, she found a Taxi, got in, and told the driver, "Take me to Sonshine Hacienda." I thank God for this wonderful nanny and her wisdom. Pray with us that God will send us more mature, Christian nannies! This story is one of the many illustrations of why Sonshine Hacienda is here. We are here to stand in the gap and protect and teach these vulnerable children. Of course, Angela had to go back through the court system, but thank God, she was officially place back at Sonshine Hacienda. I am proud to report that Angela has her smile back! Pray for us and also for the social workers of this country to use wisdom in placing children in suitable homes. *The name of this child has been changed in this article to protect her identity.